This beautiful dish shows off a few easy to achieve yet seriously impressive techniques. 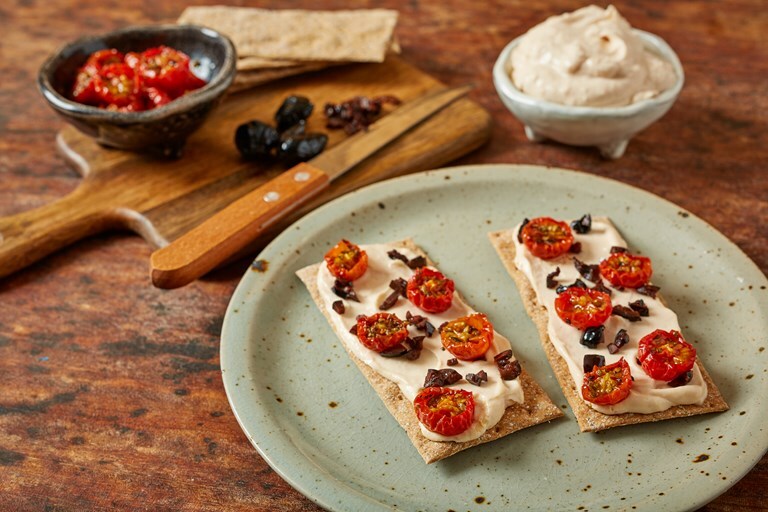 A homemade taramasalata is whizzed up in the blender, while cherry tomatoes are quickly dried in the oven to amp up their umami flavour. The black olives on top finish things off beautifully with a salty kick. Perfect for slathering on top of Peter's Yard crispbreads. Once you've made your own taramasalata you'll find it hard to ever buy the mass-produced bright pink stuff again. Available from your fishmonger, smoked cod's roe is very good value and its strong smoky flavour means a little goes a long way.